Breakfast is the one meal that I consistently struggle with my family over. My husband seems to only want to eat cereal and my boys will go for the worst possible choices in the cupboard and fridge. I might possibly be the worst of us all, I tend to grab coffee and not eat or drink anything else until the middle of the afternoon. Since my children are getting older and learning from both my good and bad habits I have been trying to make a greater effort to eat breakfast every morning. I was intrigued when a recent issue of All You magazine had a recipe for Corn and Cheddar Waffles, which looked perfect for my normally non-breakfast eating family. 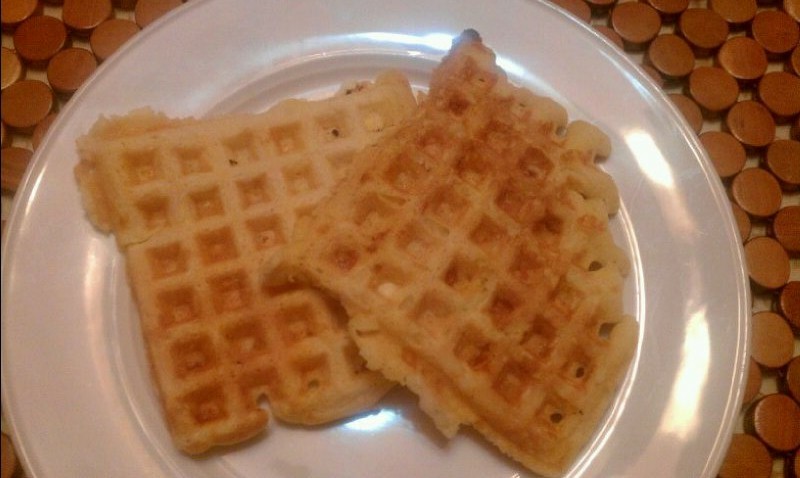 This recipe has 10 ingredients and takes approximately 10 minutes to prepare and 7 minutes per waffle to cook. I was easily able to find all the ingredients at my local grocery store and I already had the majority in my pantry. I chose to use fresh corn, I prefer the taste to frozen when it's in season. I followed the remainder of the recipe as written. I actually ended up using this recipe initially as a side dish for a meal and then used the leftovers for breakfast the next day. The taste was delicious and the only topping I used was butter. My youngest son loved these waffles and ate the majority of the servings. I liked that they were savory and worked well as both a bread side and a breakfast food. A great easy, recipe to change up your breakfast routine. For the recipe go to All You Corn and Cheddar Waffles. Yum!! Waffles/Pancakes aren't my favorite but I LOVE anything with cheese - so these looks delish! Thanks for sharing. Our families go-to is Eggs Benedict which of course is not fun for mom at 7a.m. pre coffee! lol! @Mary I have tried making Eggs Benedict and my eggs never turn out right :) I agree with you about cheese, I love it! Hmm this is interesting! I love salty and sweet combo's so I may try this and actually add in some maple syrup on the top. I'll let you know how it goes! @Sugar I bet they would be great with maple syrup. I love savory and sweet together :) I hope they turn out well!